Texas A&M Invite this weekend! Tickets will be $5(cash please), children under 5 years of age get in for free. Parking is free in lot 100C across from the PEAP building from 7:00 a.m. - 8:00 p.m. The competition will be split into two sessions and will be Modified Capital Cup format (warm up one event - compete one event). The first session will be for the Level 8 women and warm-up will begin at 9:30 am. The second session will be for the Level 9 women and men and warm-up will begin at 1:30 pm. The competition should be over around 5:30 pm. Awards will be presented after each session. Meet season kicks off next weekend with UT Dallas! The 2019 Meet season will kick off on Saturday, January 26th with the UT Dallas Invitational. The location of the meet will again be Rogue Athletics (4505 McEwen Rd. Dallas, TX, 75244). There is a small parking lot, street parking, as well as a parking lot across the street available. Open warm-up will start at 1:30 pm and competition will begin at 3 pm. The full schedule for the season can be found on the schedule page. Going to a college without a team? Want to start a new team? We're here to help! If you or anyone you know is interested in starting a new team, we would like to help you! Just fill out the "Join/make a team" link on the left hand side of the website. We will contact you to help you with the process of finding a practice location and petitioning your school, and if there are any other respondents who are attending the same school, we will introduce you to them as well! The Conference Championships were held this past weekend at Rock Solid Athletics in Lubbock, Texas. Continuing their respective undefeated streaks, the Texas A&M Women took home the level 9 title while Oklahoma took the men's side. The two teams are the reigning NAIGC National Champions and will descend on Fort Worth in a couple weeks to defend their titles. A highlight of the top performers is listed below. For full results, please see the results page. The result of the Austin invitational are here! In the level 8 competition, the gold on Vault and Bars went to A&M's Hannah Holtzman, with the Beam title to teammate Jacqueline Hollingsworth, propelling A&M to the team gold. Stealing the floor and AA titles from the Aggies was Texas State University's Abigail Schmidt. For full results please see the results page. The result of the Baylor invitational are here! As the growth of collegiate club gymnastics continues, the competition offerings available to gymnasts have increased. 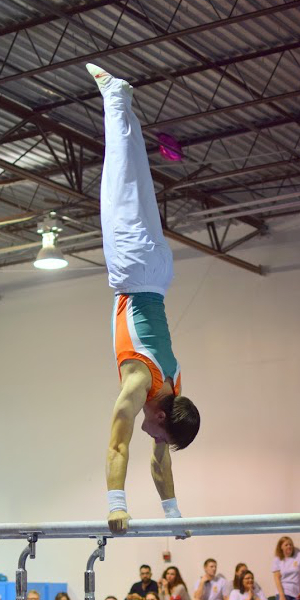 The new level 8 option in the women's competition as well as a growing adult/non-college open division for both the men and women has led to an increase in interest and participation from new and experienced gymnasts alike. Following the changes enacted by the TGC this past fall, UT Dallas became the second meet to implement the multi-level competition split this season with successful results, creating an awards process that recognizes even more of our athletes for their accomplishments. In their first TGC meet of the 2018 season, the University of Oklahoma continued their 3 year nationally undefeated streak into a fourth season. Placing first in the men's competition Oklahoma made a clean sweep, with Jaime Da Silva on Floor, Vault and All Around, Braxton Poe on Pommels, Austin Webster on Rings, and Giovanni Rossoni on Parallel Bars and High Bar. In the women's level 8 competition, Texas A&M continued on their own winning streak, with Baylor coming in second just ahead of UT Austin. In the individual awards, Texas State took it's first 2018 title on Vault with Marie Ambs, while A&M's Natalie Duranso led on Bars, UT Austin's Zerrin Vurral on Beam, A&M's Anna Lightfoot on floor and UT Austin Freshman Marie Yamamoto in the All Around. In the level 9 competition, TCU also took it's first 2018 gold with senior Morgan Hart on Vault, while UT Arlington's Lyndsay Lewellen on Bars. On the Balance Beam Texas Tech club President Meaghan Martinez led the way while teammate Wendy Carey captured Floor and the All Around titles. The next TGC competition will take place on Feb 24th in Waco Texas hosted by Baylor University. The competition will be Women's events only. Once again Texas A&M's women take home the team gold at the HNI college club invitational, with a clean sweep of the competition. In first place on Vault and Bars were A&M's Renee Woodruff and Emily Scott, with fellow Aggies Madison Haran and Taloy McDoniel on Beam and Floor, with Emily Scott securing the All Around gold. In the open Team Cup Texas A&M beat out rival UT Austin coming in three places ahead to secure a tough 12th finish. The next TGC competition will take place in Dallas, TX next Saturday at Rouge Athletics. This past weekend, the Texas A&M Invitational kicked off the 2018 season in College Station. The competition was the debut for the University of Texas at Arlington team, and saw the return of competitors from Hardin Simmons University in Abilene, Austin Community College, and Dallas based UT Southwestern. With continued growth in the sport, the women's competition has been upgraded and now features multiple levels, with a new Level 8 first debuted at the conference championships last year, and now is spread in a multiple session meet allowing for maximum participation opporunities. The next competition will be hosted by UT Dallas on Feb 10th in Dallas, TX. Season Opener at Texas A&M in two weeks! Both sessions will be held in the main gym of the PEAP Building (near Reed Arena on the Texas A&M Campus). Parking is available in Lot 100c on the west side of Reed Arena (across the street from the PEAP building). More event details can be found at the event Facebook page. Green denotes a non-TGC hosted competition to which TGC teams are in attendance. If you or anyone you know is interested in starting a new team, we would like to help you. Just fill out the "Join/make a team" link on the left hand side of the website. We will contact you to help you with the process of finding a practice location and petitioning your school, and if there are any other respondents who are attending the same school, we will introduce you as well! This past weekend the Texas A&M Women's team won the team title at the NAIGC Nationals Championships in Columbus Ohio. This marks the first time the Aggies have taken the lead for most number of titles held by a single school, previously held by The University of Texas, and tied by the Aggies in 2013. Since 1989 the Texas teams have dominated the competition, and the streak is still well alive today. While the Aggies now hold the overall record and the record for women, they are still tied with their Texas rivals for men's national titles. Sweeping the Men's side was once again was the University of Oklahoma, blowing past Temple University and ASU by several whole points. This marks the third consecutive victory for the Sooners, who are rapidly approaching their Texas rivals' record. With seemingly no stopping them the Sooners may set a new men's team championship team record as soon as 2020. In the level 8 competition, the University of Texas at Austin women came in second place with a narrow win by Universite Catholique de Louvain from Belgium. Individually, the Texas teams took home several awards, with the return of Baylor University to the championship in the first time in nearly 7 years. Finally, in the NAIGC Decathalon, a combined competition of both Women's and Men's Events, Abilene's Justin Powers took home the gold Medal and Texas' first title in that competition. 5700 W North Loop Rd. More information can be found at http://www.sundevilclassic.com/. The competition will start at 7:00pm. 86 Women and 49 Men attended the Friendship Invitational in Dallas last weekend in the largest meet so far of the 2017 season. In the team award, OU took the top spot followed by Texas A&M and UT Austin. In the team award, Texas A&M once again took home the gold. After Tulane's appearance at the Austin invite last weekend, it was Texas' turn to return the visit. Yesterday, the University of Texas, Texas A&M University, and the University of Houston traveled to New Orleans to compete at the Jazz Invitational, alongside Tulane, Georgia Tech, Mizzou and Kent State. On the Women's side, the TGC took a clean sweep of all the top spots on each event and in the All Around. Texas A&M's Emily Scott took home the AA and Beam Gold while Houston's Molly Stucky took AA second as well as Vault and Bars Gold. Rounding out the leaderboard on floor was TGC President and A&M captian Katie Thompson. In the team award, A&M continued their uninterrupted streak, with UT coming in second. On the men's side, UT's Remy Fenrich took home the title on Pommels, while A&M's Connor Tobaias won Rings, Vault and the AA. Mizzou's Chris Rediehs captured the remaining titles. In the team award, the Texas A&M Men took home the gold. 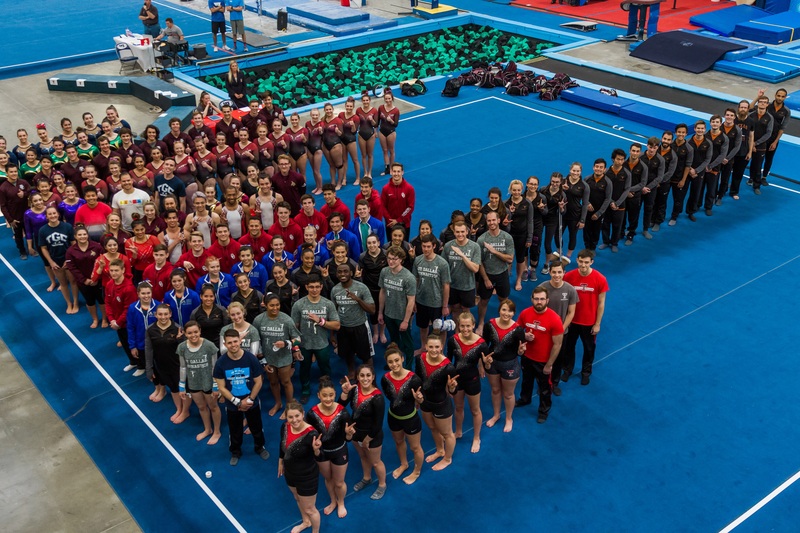 Saturday saw the first Texas meet of the season at Austin Gymnastics Club in Austin, Texas. UT Austin, Texas A&M, UT San Antonio, Texas State, the University of Houston, Baylor University, and Abilene all came to compete in the Capitol. Taking the All Around on the men's side, Baylor's David MacDonald returned to a strong season opener over A&M rivals Jake Zenker and Connor Tobias with a silver on Floor, Pommels, Rings, and Parallel Bars, with a Bronze on Vault and the top spot on High Bar. 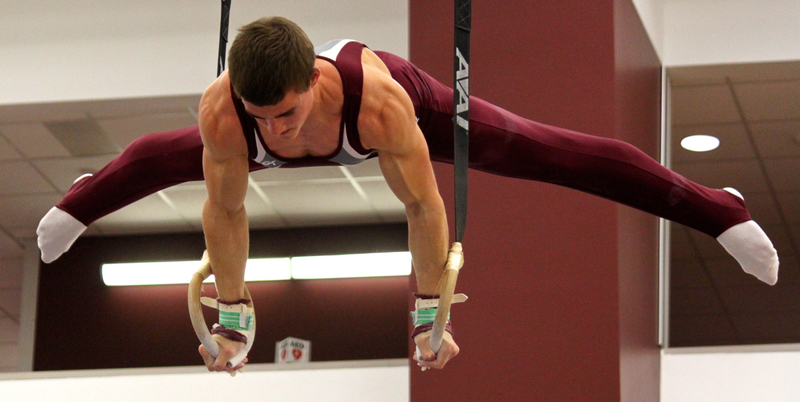 Taking gold on the other events were A&M's Jake Zenker (Floor, Pommels, Vault) and Connor Tobias (Rings, PBars). Texas A&M took a 10 point lead over the longhorns to bring the team award home. On the women's side, University of Houston's Raquel Chavez returned another year to shine and took the All Around with the top Vault, and Silver on Bars and Beam. Taking the other events were A&M's Emily Scott on Floor, Madison Haran on Beam, and Isabel Mio on Bars. In the team award A&M continued their TGC winning streak, once again barely hanging onto a few tenths lead over rival Houston. In the open division, the Austin Gymnastics Club women went head to head with the TGC alumni, coming in 3 points ahead. A&M Alumnus Sydney Riegel took the All Around gold and the top spot on bars and beam, while AGC's Jules Savage took the remaining events. In other news, former McMurry University competitor and TGC Board Member Justin Powers competed in the alumni division this weekend as he performed 10 routines on both Men's and Women's events in preparation for a Decathlon Competition in April. Justin switched disciplines in 2015 to compete at the NAIGC championships on women's events, where MIT's Julia zSharpe has been competing Men's events for a few years. In April the two competitors are expected to go head to head at the NAIGC National Championship for the top spot in the first decathlon award. The weekend also saw the return of gymnasts from Tulane University in New Orleans, who last competed in Austin in 2007. On Feb 4th TGC competitors will descend on New Orleans for the first time in over a decade to attend the Jazz Invitational, hosted by Empire Gymnastics Academy, the hosts of the Tulane University Gymnastics team. Information on the event can be found on their website. The University of Oklahoma Competed this weekend at the Atlanta Centennial Classic. The Reining National Champions defended their title by 5 points against Arizona State, with Tyson Campbell Taking the gold on Vault and Ty Montgomery on High Bar and Parallel Bars - rounding out the top four spots on the event for the Sooners with Dustin Higdon, Chris Simpson, and Riley Adams. Scores for both of this weekend's meet can be found on our schedule page. Earlier this month the TGC held its annual meeting at the GAT conference in Austin, TX. Representatives from our schools held the meeting to conduct annual business, including creating the season's meet schedule and electing the board for the new year. With the new outreach program instituted last year the TGC is now assisting students in facilitating new club teams at schools around the state. If you or anyone you know is attending college and is interested in club gymnastics please contact us or have them fill out our contact form! We have several new freshmen and are starting new teams at Austin Community College, UT El Paso, UNT, and several smaller schools around the state. We would love to have a team at all of the large schools in Texas and are currently looking for teammates for some gymnasts at our smaller schools. The TGC has also recognized the growing industry market for competitive adult gymnastics, many of whom are our recently graduated college athletes and we are exited to help grow the sport in this new direction. If you are interested in the adult league please let us know. Finally, we have released our preliminary 2016-2017 competition schedule, which can be found at the link to the left. Please mark your calendars and join us for another exiting season! Come out to Chisholm Trail High School today in Fort Worth for the High School State Championship! We are here recruiting and letting people know about college club gymnastics! Stop on by the booth! NAIGC Nationals 2016 Results are in! The TGC attended the NAIGC National Championships in Sacramento this year and brought home several titles across the board. -Raquel Chavez, University of Houston, took home a 2nd place title on Vault, and a 4th place trophy in the All Around Competition. -From Houston, Haley Poinsette took home a 4th place Vault, 3rd place Bars, and 10th in the Level 9 All Around. -Molly Stuckey, from Houston, took home a 9th place on Vault, 2nd place Bars, 7th place Beam, 5th place Floor, and third in the All Around. -From Texas A&M, Emily Scott took home second place on Beam and 10th place on Floor. -From A&M, Madison Haran took home 3rd Place on Beam and 6th Place All Around. -In the team competition, Texas A&M came in 4th. -From UT Austin, Isabel Earl took home 3rd on Bars. -On the Floor exercise, the University of Oklahoma took home 4 titles, with Riley Adams (1st), Ryan Terrill (2nd), Jacob Maloley (4th) and John DeJulio (5th). Andrew Archer, A&M, took home 9th. -On the Pommels, Ty Montgomery took 2nd, Ryan Terrill 4rd, Morgan Kieth 6th, and Cameron Callaway 10th, all from Oklahoma. -On Rings, Oklahoma took the top three for Jacob Maloley, Jaime Da Silve, and Cameron Wright, with 8th place going to Ryan Terrill. Coming in 9th was Connor Tobias (Texas A&M). -On Vault, Riley Adams (Oklahoma) took gold, Andrew Archer (A&M) Silver, Tyson Campell (Oklahoma) 4th, and Ryan Terrill (Oklahoma) 6th. -On the Parallel Bars, from Oklahoma, Ryan Terrill, Ty Montgomery, Morgan Kieth, and Jamie Da Silva took home 2nd, 5th, 6th, and 7th place. -On High Bar, from Oklahoma was Jaime Da Silve, Ryan Terrill, Ty Montgomery, and Morgan Kieth taking second through fifth place, with A&M's Connor Tobias taking home 6th. -In the All Around, OU's Ryan Terrill took home first, and A&M's Andrew Archer and Connor Tobias 3rd and 5th. 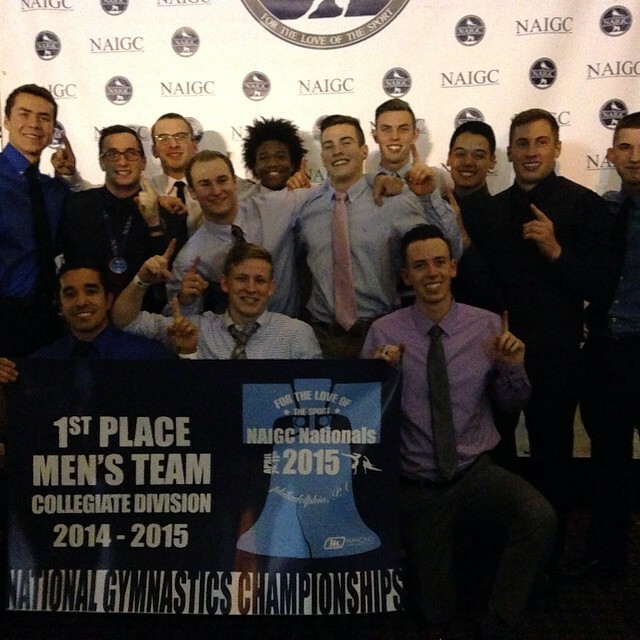 -In The team award, OU Took home the gold, defending their title from 2015. In the Open competition, A&M Alumni Billy Conte took home 6th on Pommels, 3rd on Parallel Bars, and Fellow A&M Alum Chase Hames took home 6th on High Bar. Full results can be found on the NAIGC website. Full results can be found on the schedule and results page. This past weekend at Texas State University the TGC gymnasts faced off for the Texas State meet. Taking home the Gold in the all around and every event but rings was Connor Tobias from Texas A&M University. Stealing the rings title from the star Aggie was Texas State freshman Will Clayton. In the women's competition, A&M's Madison Haran won the All Around title, Vault and Beam while Floor went to fellow Aggie Emily Scott and Bars went to Houston's Molly Stuckey. In the team competition, the Texas State Men and A&M Women took home titles. This weekend also saw the first competition from the newly formed University of Texas at San Antonio's team. Competing for UTSA was the club's founder and former High School Gymnast in El Paso, Ernesto Castro. Ernesto will be joined by more of his fellow teammates on April 2nd at the Texas A&M competition in College Station. With the TGC women facing off for the second time this year the stars of the individual competitions were from newcomer University of Houston. UH's Haley Poinsette took home gold on Vault, and Floor with silvers on Bars and in the All Around. Fellow Coog Raquel Chavez took home the titles on Bars and All Around with Silver on Beam. UT Austin's Jackie Holland took the Beam title. In the team competition, A&M once again took home gold with UT Austin and Baylor coming in second and third. The next competition will be held at Texas State University on March 5th and feature the debut of our newest team, the University of Texas at San Antonio. Event details can be found on the schedule page. This past weekend was the beginning of the 2016 season for many of the TGC teams. They faced off in Dallas, Texas at the UT Dallas hosted meet on Saturday. The Texas A&M Women came in first ahead of Texas Tech, with Baylor in a close third place. Aggie Madison Haran took first place on Vault While the University of Houston's Raquel Chavez rounded out the top spots on the other three events, securing her all around victory. On the men's side, the home team UT Dallas came in 1st with a victory over Texas Tech as Suhrud Kulkarni took home gold on Vault, High Bar and in the All Around, as Baylor gymnast David MacDonald won the Floor Exercise and Rings. Texas Tech Gymnast Bradley Teltschick took home the Pommels title leaving UT Dallas' Caleb Meyer to take home the Parallel Bars title. At the same time these teams were in Dallas, the Men from Oklahoma and Texas A&M went head to head in Oklahoma City at the Bart Connor Invitational where the Sooners defended their national title against the Aggies. Full results from both meets can be found in the sidebar on the schedule and results page. On Sunday the 28th the TGC womens' teams will face off at Baylor. Come Support our Gymnasts in Dallas! On Saturday the 13th the TGC will kickoff their season with the UT Dallas home competition at Eagles Wings Athletics in Allen, Texas. If you are in the area please stop on by and support our gymnasts! We also would like to ask for our fans help in the University of Houston's petition for an on-campus facility. You can view and sign the petition here. This past weekend at the Houston National Invitational Competition, the Texas A&M men's team came in 6th place earning them a $250 prize, while the University of Houston's women's team won 5th in their session claiming a $100 prize. Although the HNI competition was the season's first for these two teams, most will make their debut next weekend at the University of Texas at Dallas invitational. The UTD meet will be held at Eagles Wings Athletics in Allen, Texas and the competition will start at 7:00 pm on the 13th. For more information on all our upcoming events, please see the schedule page. Yesterday the first competition of the season saw mens' teams from Texas A&M, Oklahoma, and Arizona State go head to head at the Metroplex Challenge in fort worth. In a close upset, Arizona State University, who won the NAIGC national title in 2014, came out on top with a narrow victory of Oklahoma, the 2015 reigning national champions. ASU scored with a small margin of 405 points to Oklahoma's 402.5, leaving Texas A&M coming in third. In the individual results, Oklahoma's Giovanni Rossoni won 2nd place on High Bar with teammate Jaime DeSilva earning third, with a 1st place finish on vault. Morgan Kieth took home a bronze on Pommels and a bronze Parallel Bars, just behind teammate Ty Montgomery's second place Parallel Bars win. Finally, on the Still Rings, Cameron Wright won second and Jake Maloley third. 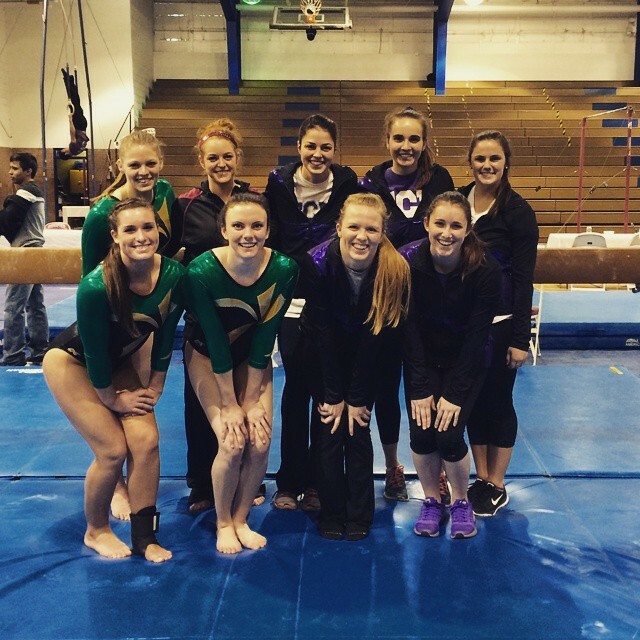 This event marked the first competition of the 2016 season for these two TGC teams. The TAMU men will compete next weekend in the HNI competition, and the other TGC teams will make their debut in the DFW area on Feb 13th. For full information, please see the schedule page. Come support our gymnasts at their upcoming competitions! The 2016 season is here and we have some exciting events coming up! The teams will arrive to warm up at 5:20 pm. More information can be found at their website. Information on the HNI meet can be found online at their website. February 13th will mark the first weekend of competition with all TGC teams in competition. The Texas A&M, Iowa, and Oklahoma Men's club teams will be at the Bart Connor Invitational in Oklahoma City, OK. The clubs will begin warm-up at 6pm and start their competition at 6:25pm. The meet will be held at the Cox Convention Center in Oklahoma City. More information can be found on their website. The rest of the TGC schools men's and women's teams that weekend will be at the UT Dallas Competition hosted by Eagles Wings Athletics in Allen, Texas. Competition Start Time is 7:00. Teams will begin warming up an hour earlier. In more unfortunate news, the Texas Tech Invitational meet has been cancelled for this year. The 2016 competition schedule is here! In other news, the Texas High School Gymnastics Association has approved a new scholarship program to funnel their gymnasts into collegiate club gymnastics. Each year they will award $1000 to one male and one female senior student as they embark onto their collegiate career. Additionally, we are excited to welcome the club team at Rice University into the Texas community. The annual TGC meeting will be held at the GAT conference in Austin Texas at the Renaissance Hotel. The meeting is at 3PM in the San Antonio Room, located at the downstairs level. On April 8th the schools in the Texas Gymnastics Conference attended the NAIGC national championship in Philadelphia, Pennsylvania. After three days of fierce competition they returned home with 48 awards, including one first place team title, one all around title and 7 individual event gold medals. Taking the gold in the men's team competition for the first time was the University of Oklahoma, with Texas A&M coming in third. The Sooners have competed the entire season undefeated, having mirroed their NCAA brothers, who won the NCAA collegiate championship. On the women's side, the Aggies also took third in the level 9 competition with the Longhorns winning the bronze in level 8. Taking the all around title home to Texas, UT Dallas' Tommy Trompeter finished his senior year with the top award in the men's collegiate competition. Solidifying his title, Tommy also took home a gold on the high bar and rings and silver on the parallel bars, while also receiving 5th on pommel horse and 6th on the parallel bars. Other gold titles going to the TGC included men's vault for Aggie Andrew Archer, womens level 8 uneven bars for Longhorn Jacqueline Holland, women's level 9 beam and bars to Aggie alum Molly Stuckey and a 1st on floor for McMurry's Justin Powers. Get as many of your alumni to attend the State Championship this year at Chisolm Trail. Have them fill out their contact information in the high school history booth, donate $5.00 (or more) and we could award your program $50.00 per alumni up to $2,000. The top three schools from the host meet area (Region I and IV) AND the top three schools from the non-host meet area (Region II and III) will get the money - six schools in total. After 49 years, we are now actively seeking alumni info in order to raise money, awareness and support for the THSGCA. We hope to earmark donations for scholarships to Texas HS Gymnasts who continue competing in Texas College Club Programs! THSGCA Treasurer, Cameron Sweny added: "This is the first step in a long process to build a working relationship between Texas High School Gymnastics and the "Texas Gymnastics Conference" of college club gymnastics." This news comes off of the successful fund-raising effort last year by Texas A&M University who raised $4,000 for their program through alumni donations. "As the TGC has grown in recent years we find ourselves with more and more gymnasts participating well into their college careers. As the size of competitions scales upward and new clubs appear at schools throughout the state, we need to find new ways to handle and fund that growth without increasing costs for our student athletes who are paying their way through college," added Andrew Hutcheson, TGC President. "We are exited about the THSGCA's initiatives and look forward to working with them to provide gymnasts with opportunities after high school." If you would like to make a donation to support high school athletes, or any information about high school programs in Texas, please contact Mark Sherman. For information regarding collegiate club programs and the TGC, please use the contact us form by clicking the link to the left. More information on the THSGCA can be found on their website. Yesterday the TGC teams faced off once more for the final showdown of the conference season. Emerging undefeated on the women's side were the Texas A&M Aggies, claiming 17 spots on the podium. Taking the All Around title was A&M gymnast Madeline Fletcher, making her first claim to the distinction for the season. Madi also placed third on Vault and Floor, and took home the gold on the Balance Beam. On the other events, Aggie Hannah Van Meter took home the	Uneven Bars title while Longhorn Tori Klabunde took first on Vault and Floor. On the men's side, the University of Oklahoma also took home the team title making them undefeated for the season as well as Sooner Will Knox took home titles on Pommels and the Parallel Bars, while teammate Tyson Campbell ties A&M's Jake Zenker for gold on the Floor Exercise. Zenker's teammate and Team Captain Andrew Archer took home the Vault title from Runner-Up Tommy Trompeter. Trompeter, the TGC star at UT Dallas took home the High Bar and Rings titles, paving the way for him to reclaim his all around title. Although the conference season may be over, the competitors aren't done yet. The teams are gearing up for one last showdown on April 9th as they attend the NAIGC Nationals competition in Philadelphia, PA. With 1100 competitors from 31 different states representing over 80 schools, the TGC is ready for a fierce competition. Both the Texas A&M Aggies and the UT Longhorns are tied - for both Men's and Women's NAIGC National Championship titles, giving both of the rival schools the distinction of having the more team awards than anyone else and putting the TGC at the top of the nation. For more information, please see the NAIGC Nationals web page. Hook'em, and Gig'em! You can send your favourite teams your best wishes by liking and supporting them on their Facebook pages, which can be found on the teams link to the left. With their public school rivals on spring break, the two private institutions faced off this past weekend in Abilene. The Bears finished first, with Julia Stricklin placing first on the Uneven Bars and Balance Beam. Competing as an individual, Red Raider Bethany Pryde took home the remaining event titles, securing her victory in the All Around. On the men's side, the individual competition saw six all-arounders go head to head. Taking home more titles, UT Dallas' Tommy Trompeter picked up gold on Pommels, Rings, Vault and the All around competition, with Baylor gymnast David McDonald on the Horizontal and Parallel Bars. McMurry University's Justin Powers took home the floor title - which he previously has held multiple times at the national level. The TGC faces off one more time next weekend in San Marcos, TX for the Conference Championship. Details of the competition are posted in the schedule page. Be sure to come out and cheer on your favorite schools as they face off for the conference title. The TGC travelled to College station once again to meet the Aggies at home. In a narrow margin, the Aggies held on to their previous title, scoring silver in the team award. With only one tenth to spare, the Aggies stopped the rival Longhorns from taking the silver against the gold winning Sooners. Sooner Will Knox swept most of the gold, taking the title on the Pommels, Rings and Parallel Bars. Sooner teammate Giovannni Rossani took the Horizontal Bar and Tyson Campbell won the Floor Exercise, and Andrew Archer won Vault for the Aggies. Taking the top spot in All Around this weekend was Longhorn Bryce Cashell. Having competed as an undergraduate for Odessa, Austin Community College and Texas State University, Bryce Cashell entered his college career on three back to back state High School All Around Championships. The three time NAIGC National Collegiate Vault Champion is back one more time while he completes graduate school. On the Women's side, Madison Haran took home gold on the Uneven Bars and Floor, solidifying her All Around Victory. Fellow Aggie Caci Jarvis won the Balance Beam as the Unstoppable Aggies secure their 4th victory of the season. Since the TGC Championship meet in April of 2011, the Lady Aggies have gone Undefeated in conference for 18 competitions with no end in sight. The Lady Aggies claimed the national title in 2009, 10, 11, and 13, helping them gain the 2013 distinction of the first club to win both the Men's and Women's NAIGC National titles in the same year. This weekend also saw an old TGC club gain a renewed appearance, as the University of Houston's Haley Poinsette claimed the top Spot on Vault. Houston last competed with the TGC in 2011. Missing from the action this weekend were Texas Christian University and Baylor University, both of whom are enjoying the beginnings of their spring break. Conversely, with the public school's spring breaks a week later, the two private institutions are geared up for a head to head competition with each other in Abilene, on March 21st. The TGC Travelled to Lubbock, Texas this weekend to take on the Red Raiders. On the men's side, Andrew Archer once again took the all around spot for the Aggies, with help from gold on the Floor and Parallel Bars, and stopped the Sooners from a six event sweep. 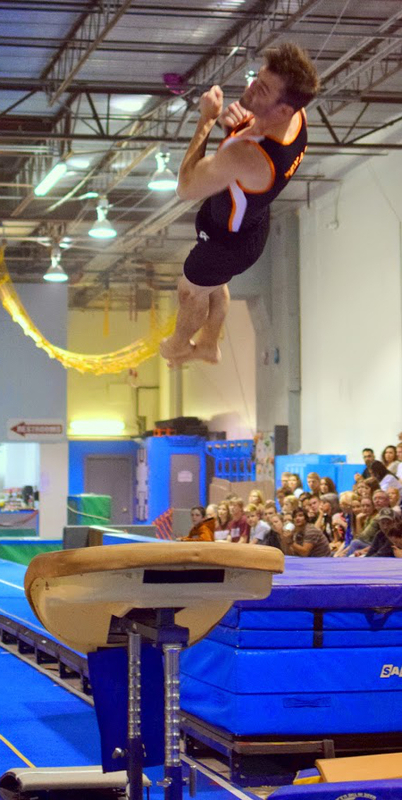 The Pommel Horse and Rings titles were taken by Sooner Will Knox, while teammates Tyson Campbell and Giovanni Rossani took Vault and the Horizontal Bar, helping to lead them to another team title. Short on a full team, the Aggies couldn't stop long time rival UT Austin from taking their second place title away as they both fell short of beating the unstoppable Sooner juggernaut. On the women's side, A&M continued their undefeated streak and swept up all the gold as Madison Haran took Vault and Floor, with Hannah Van Meter taking Bars and Madeline Fletcher on Beam. An infant compared to it's century-plus old sister institution in Austin, The University of Texas at Dallas, founded by UT Austin Alumnus Ryan Huffer in 2010, hosted it's first competition this past weekend. Upsetting the season long winning streak of rival UT Dallas gymnast Tommy Trompeter, A&M's Andrew Archer took home the gold in the Men's All Around competition. Archer, who took home titles on Parallel Bars, Vault, and Rings, beat out Trompeter, who won the remaining events, by only a narrow 5 hundredths of a point. Coming up third and fourth in the All Around were UT Austin's Bryce Cashell and Mudeer Habeeb. A&M took the team title for a second time, with UT Austin moving past their sister school into second place, just under the Aggies. In the women's competition, A&M continues to take the team title - with Madison Haran regaining her Beam title and picking up first on Vault for a top spot in the All Around. On Floor, University of Texas first year TGC Gymnast Jackie Holland soared past the four of her Aggie rivals to claim the floor title, and A&M's Katie Hansen won the Uneven Bar competition, with her teammates Hannah Van Meter, Madison Haran, and Madeline Fletcher rounding out the top four spots on the bars to A&M. As the TCU women's team doubled in numbers, formerly active TGC member, The University of Texas at Arlington, dusted off a years long absence with the arrival of Dominic Kotzer. The TGC gymnasts will meet again in Lubbock on February 21st. For more information, please see our schedule page in the menu to the left. This past weekend the TGC Women competed in Waco, TX at the Baylor hosted competition. The Lady Aggies continued their undefeated-in-conference streak as gymnasts from TCU made their inaugural debut. Placing 1st on the Uneven Bars, Hannah Van Meter picked up the All Around title, while fellow Aggies Katie Hansen and Caci Jarvis took home gold on the Uneven Bars and Balance Beam. Picking out the top spot on floor was Tori Klabunde from the University of Texas. In Dallas, Tommy Trompeter once again took all around in the Metroplex Challenge with a gold on the Pommel Horse. From Washington, Justin Rowen took 1st on Vault while Teammate Aaron Moss won the High Bar competition. The TGC's Will Knox from Oklahoma took home the Parallel Bars and Rings titles, while teammate John DeJulio tied on the Floor Exercise with Washington's Nathan Tsuji. The TGC's next competition will be on Valentines Day, for the first-time-hosted by the University of Texas at Dallas Meet, as a session in the Friendship Invitational. 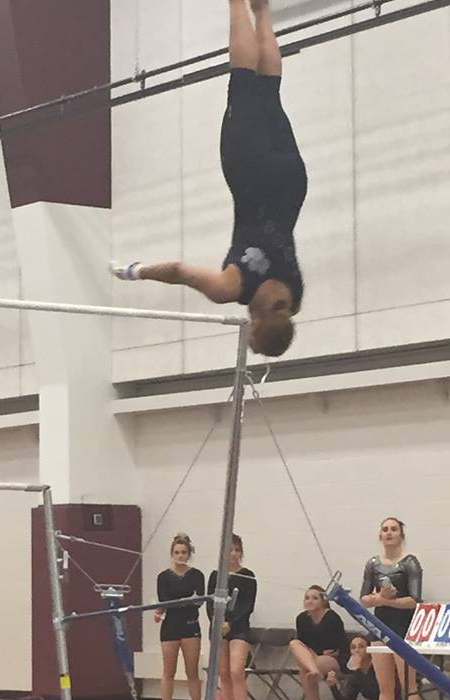 On January 24th, Texas A&M University hosted the inaugural meet of the 2014-2015 season. The University of Oklahoma men's team placed first with Tyson Campbell taking home the floor title and Will Knox sweeping on the Rings. In the Men's All Around, UT Dallas' Tommy Trompeter took home the gold, along with the titles for Pommel Horse and the Horizontal Bar. On Vault, A&M\'s Andrew Archer took home 1st while UT Austin's Mudeer Habeeb took home the Parallel Bars title. On the Women's side, Madison Haran swept the competition with the All Around title, with gold medals on Floor and Beam. A&M rounded out the gold with Madeline Fletcher taking home 1st on Vault and Hannah Van Meter on the Uneven Bars. Eastfield College of Dallas made it's inaugural TGC appearance with a pair of gymnasts, Cameron Callaway and Alex Milner, competing for the Harvesters at their first meet. Next weekend will be a split location competition for the men and women. The next meets will be held with the Men competing at the Metroplex Challenge on Friday in Dallas, and the Women competing in Waco at the Baylor invitational on Saturday. Texas A&M hosts the first meet of the season. On January 24th, Texas A&M University will be hosting the inaugural meet of the 2014-2015 season. For more information on how to attend, please see the schedule page. The 2014-2015 Season is about to begin! Texas gymnasts gear up for another exciting year of competition. The 2014-2015 Schedule is here! Congratulations to our newest member schools! The University of Oklahoma and Tulane University join the TGC. The University of Oklahoma and Tulane University have been inducted into the TGC! Founded 35 years ago, the TGC has been the driving force behind collegiate club gymnastics in the state of Texas. With very limited NCAA opportunities in the state, the TGC has made its mission to improve and promote the sport in the state at a collegiate level. The success of the TGC has allowed gymnasts to continue their passion for the sport and continue to challenge themselves while building memories that will last a lifetime. This year, the TGC has inducted the University of Oklahoma and Tulane University to join our organization and create those memories with us. As we move forward, our two new members, currently the only club university gymnastics programs in their respective states, will gain more opportunities to participate in competitions and join in our ever growing community. We have reinvented our web presence. On behalf of all our members, we would like to welcome you to our new website. The Texas Gymnastics Conference has been growing in the past decade and to help better facilitate our message and better communicate what we are all about, we have given ourselves a facelift, complete with mobile support. Over the next few months we will be expanding the information on our website, adding new sections and more history, photos, videos and media. Stay Tuned!